Yesterday APEX 4.1.1 Patch set was made public. If you already have APEX 4.1 installed you can download patch number 13331096 from My Oracle Support. 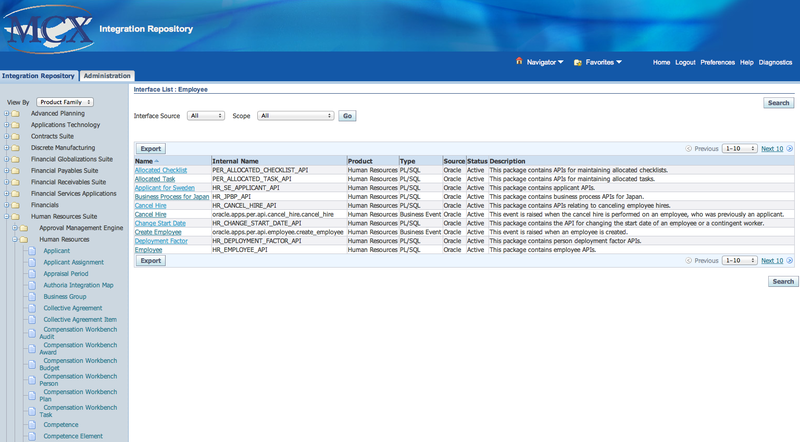 If you are on a previous version of APEX you can download the complete install of APEX 4.1.1 from OTN. I installed the patch today on my APEX 4.1 instances and it installed without a problem. It took not more than 5 minutes to complete the entire patch. When I first did the copy it included another images folder. If you go to your images folder and go into the themes folder you should find the new theme 24 folder. If you find it, than everything is copied ok. Which brings me to; there is a new theme in APEX 4.1.1. Theme 24, the "cloudy" theme! This theme looks very nice and more 2012 (bigger fonts etc). It would be great if Oracle would setup an official theme repository, like they did for plugins. Designing nice looking sites takes time and the web design "trends" change fast. Workspace "" is inactive. Contact your administrator. This was due to the way I created some of those workspaces in APEX 4.1. It doesn't work. Thanks to the APEX development team to diagnose the cause so quickly and come up with the solution. Patrick Wolf posted a script to fix any workspaces you may have with that issue. I definitely think it's good to apply this patch. I already applied some one off patches before for the urgent issues I was facing, but having this patch set brings you immediately to the latest and greatest! 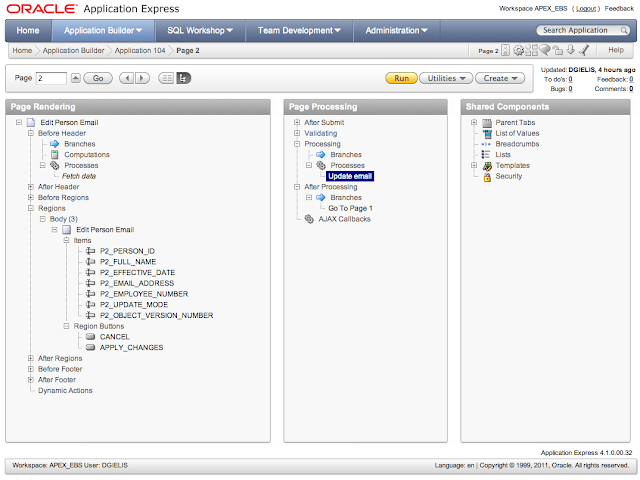 In the previous posts I mainly focussed on getting information out of E-Business Suite and use it in my APEX application. This is especially useful for people using APEX. I can imagine that people coming from the E-Business Suite are not that interested in creating stand-alone APEX applications, but they are more into creating an APEX page to extend EBS. They want to be in EBS, and in the menu some links will just open up some APEX pages. They want to see the information that is relevant at that time and have a seamless integration (so no extra logins etc). We can obviously use many of the techniques described in the other posts, but how does the authentication, authorisation etc work? Most of that is described in the Oracle white paper with a good example (starting at page 11). I might do some extra blog posts about that integration, but it will be in line with the white paper. Another way to integrate with E-Business Suite from APEX is through Webservices. You could setup a complete BPEL and SOA environment or you can do it a bit simpler. First you start by going to the EBS Integration Repository. I found it useful to view by Interface Type as then I could select XML Gateway Map. For the different products inside EBS you find the different gateways. Most of them have a WSDL. I won't give a complete run through demo as I'm currently working with HR and I didn't see an XML Gateway for that. Nevertheless I will tell you how I would do it. 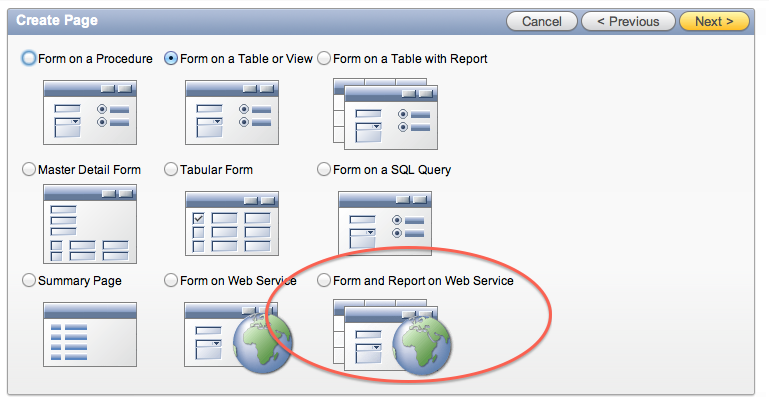 In APEX go to Shared Components > Logic > Web Service References. And follow the wizard from there. You don't need to search the UDDI, you can just copy the WSDL location. Once the wizard is finished I tend to create a new page (form and report) based on this Webservice so I don't need to create the possible parameters/items manually etc. 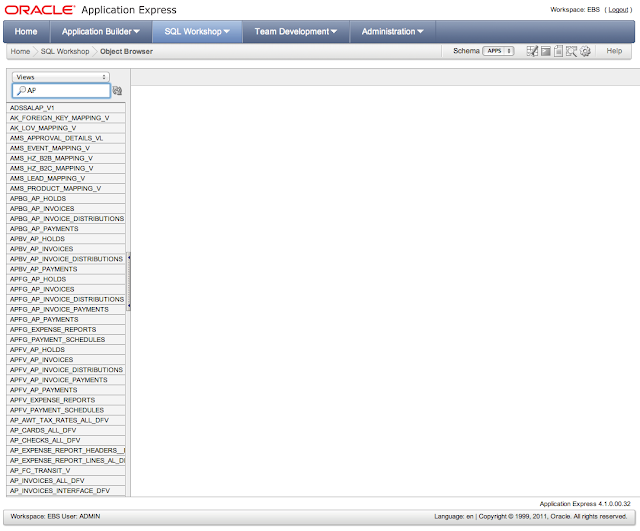 I decided against integrating E-Business Suite Open Interface into my APEX application as I didn't really need it at the moment. Nevertheless I want to quickly give my view on it. 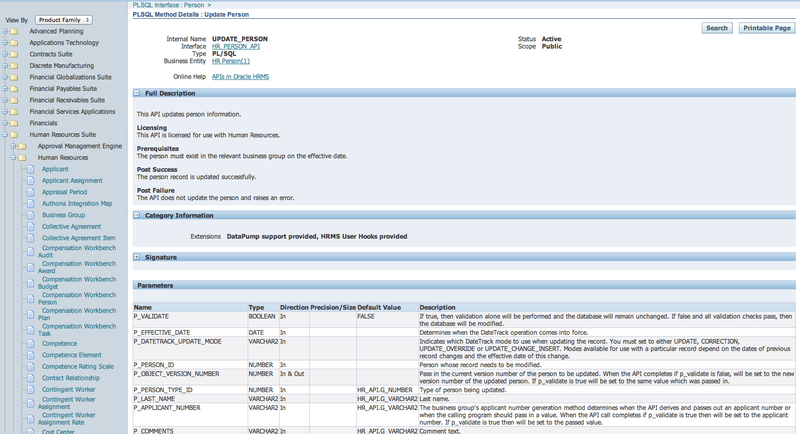 Open Interface tables (OIT) seems to be the common use to do interfacing with EBS. It looks especially interesting when you have to load a lot of records into EBS. Open Interfaces do a lot more than the API calls, in fact they may do multiple API calls at once and they keep error records too. Many products in EBS have a number of OIT available. If you google for Open Interface table (or just open interface ebs) you find a lot more info than I'm giving here. This picture comes from Dmitry Vostokov site. 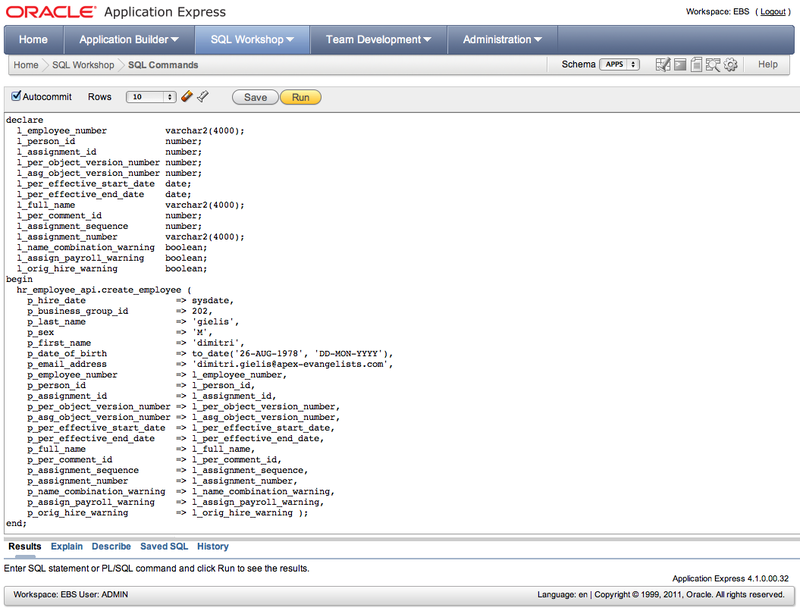 While I was looking into E-Business Suite and especially the API calls, I wondered how I could debug what was going. I find it important to understand what I'm doing. EBS is big, but the more I get into it, the more I want to know what is going on (because the more I get into having issues ;-)). Although I don't have the time right now to really dive into a detailed EBS-APEX debugging post, I quickly want to share my ideas. Unfortunately if you don't have SQL Plus or SQL Developer access to the EBS database and you only have APEX, what do you do? It would be nice if the TRACE_DEST parameter would allow HTP as a value, but it doesn't. I hope by reading the code you understand what I think would be a good way to debug your EBS code in APEX. I didn't find the time yet to write an entire EBS-APEX debug package, but maybe some of you already did or if you want to complete the above code, feel free to share it in the comments. In the previous posts I showed how to call the EBS APIs in a Page Process of the APEX page. Before that post I blogged about using views to query the EBS data. In this post we will do a combination of those techniques. In APEX you can develop really fast; e.g. when you create a Form on table with Report, in less than a minute you have an Interactive Report where people can view and analyse the data in different ways. Clicking on the edit link in the report will allow you to update and delete (and create) the data. By building your pages manually and creating the fetch and process data manually (as in the previous APIs posts), you lose a bit of productivity. By using updateable views you gain again some development speed. The updateable view technique, which means creating "INSTEAD OF" triggers on top of your views, is not specific for EBS, but you can use in any project (for example in 2006, I blogged about this feature when I was using it in DG Tournament). That error was solved by adding a commit in the trigger. On page 10 of the Oracle whitepaper about the integration of E-Business Suite and APEX you find another working example of the updateable view method with the FND_FLEX_VAL_API without an autonomous transaction. So which technique is best? Using updateable views or call the APIs from the Page Processes? It depends, they have both advantages and disadvantages, but sometimes you don't have a choice and can't use the trigger method. Takes more time to build the pages and processes manually. There is a wizard to build on top of a procedure too, but I find that still slower than if you can use the wizard to build on top of a view/table. If you experienced other advantages/disadvantages, feel free to comment. 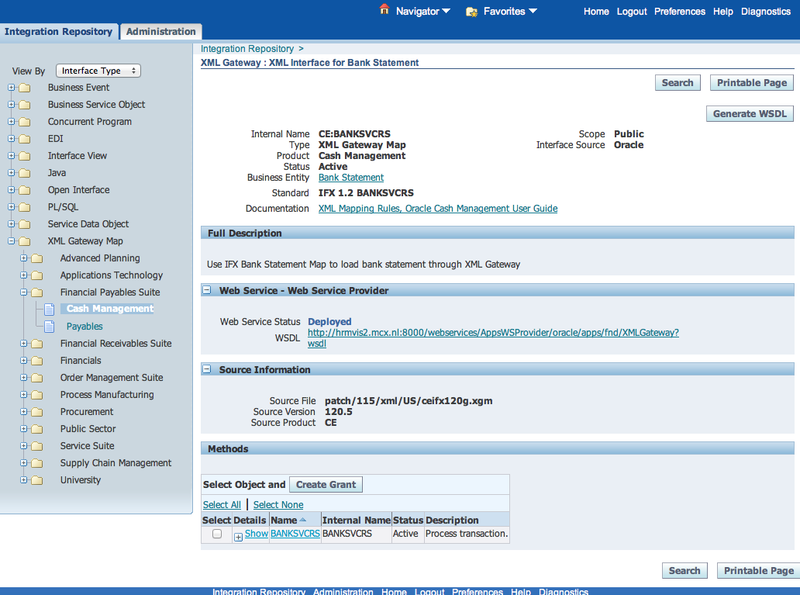 E-Business Suite (EBS) is a beast... it's the biggest environment I've ever seen. Over 50,000 packages, over 40,000 synonyms, over 30,000 views in one schema... impressive! 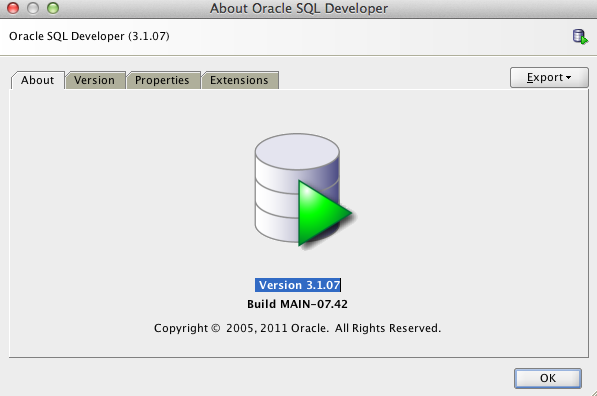 As I don't have direct access to the Oracle EBS database, I do everything through APEX. 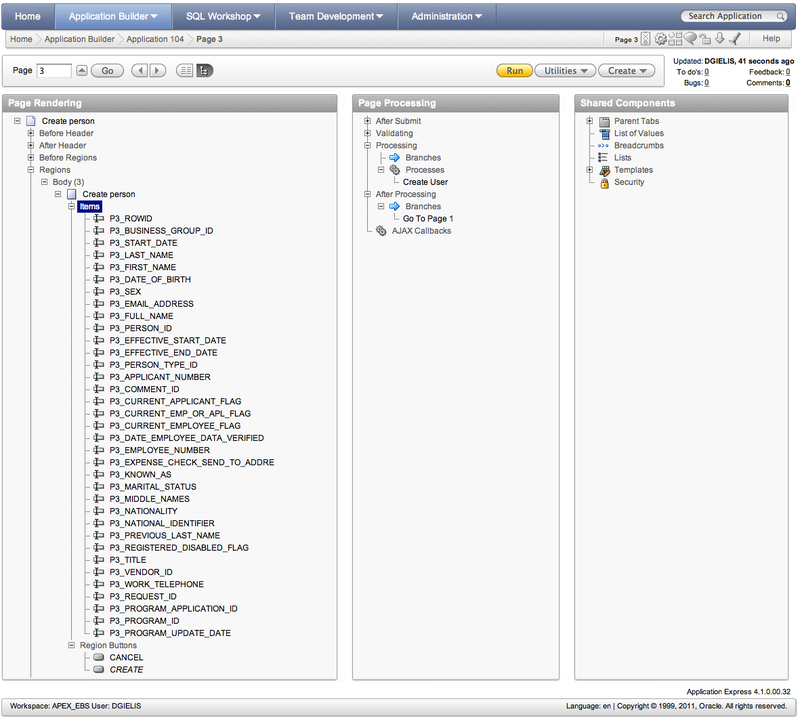 I setup two workspaces, one linked to the APPS schema, where I only use SQL Workshop to access the objects and another workspace which holds my applications and database objects and grants to some objects in the APPS schema. The issue with the Object Browser in SQL Workshop (in APEX) is that it will only show 10,000 objects. So there is a chance that if you create your own view, synonym or package that you won't see it. Even if you try to filter the result, it won't show up. 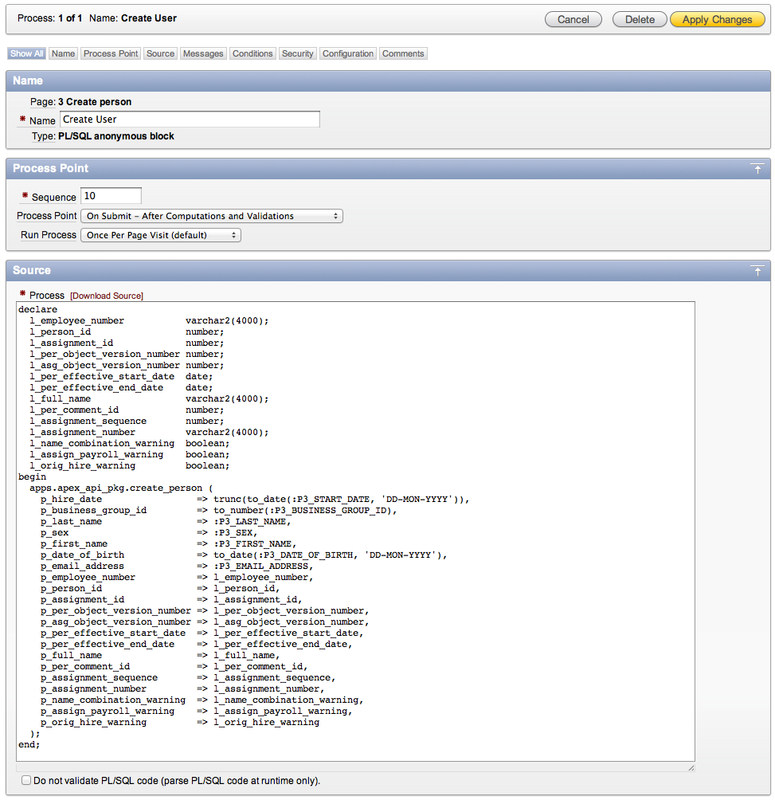 Obviously you won't see many environments having over 10,000 objects in one schema, but I thought to post it anyway as some other EBS customers might hit the issue too and maybe when the Public Oracle Cloud is online and you do everything through the APEX screens you might hit this issue too (if it was an EBS environment for example). The other issue I encountered was in the APEX wizards when I created a Form on a Procedure, when the package/procedure resides in the APPS schema. It kept spinning and spinning and after a couple of minutes I just closed my browser because I didn't want to wait longer. I guess it's because the APPS schema is so big and reading from the data dictionary takes a long time, potentially even longer than the web server timeout. The workaround here is to add a blank page, create an HTML region and add your items manually. 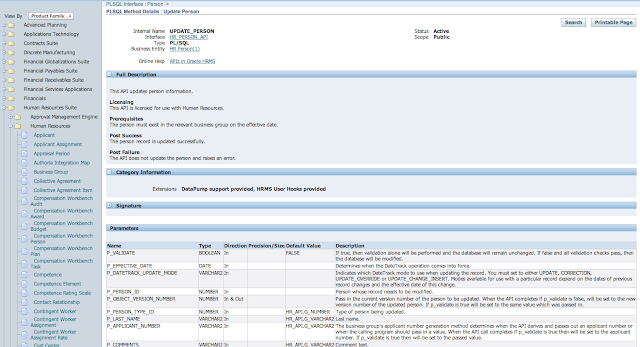 Also don't forget to add your process to the page to fetch and/or store the record. Hope that helps some people who can't find their objects in SQL Workshop or who find the wizard is slow or doesn't complete in an EBS environment. 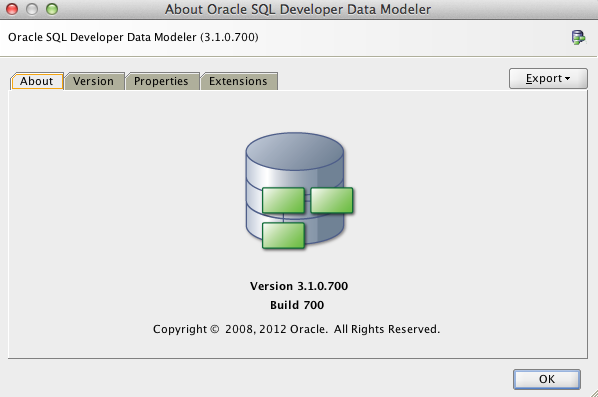 And also Oracle SQL Developer Data Modeler got a new version: 3.1.0 (700) which hold some new features like synchronisation between model and data dictionary and versioning of designs. You can download it here. Installation and migration of settings of my previous version went without any issues. I couldn't live without those tools anymore. Previously we used the HR_PERSON_API to update the email address of a person. In this post we will use the HR_EMPLOYEE_API to add a person. The second thing I tend to do is test the API in SQL Workshop in a PL/SQL anonymous block from a workspace linked to the APPS schema. When I ran that block of code I got a ORA-01403: no data found error. I verified my call multiple times but I couldn't see what I was doing wrong. Finally I send the statement to Thierry Vergult from Popay as I was out of ideas. He told me to try a trunc around sysdate for the parameter p_hire_date. I verified the API again and p_hire_date should be a date, sysdate in my opinion is the most known date, so I was a bit sceptic at first... but I tried it nevertheless... and it worked! So once that was working I included the create procedure in my apex_api_pkg. 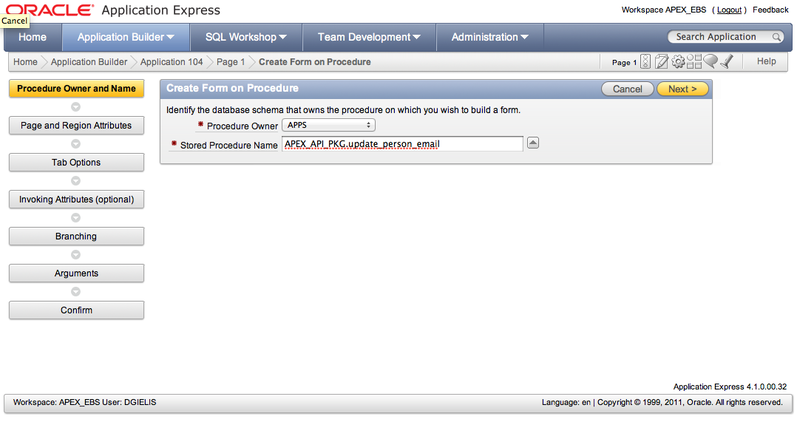 The finally step was to add a form on my page with the items and a process that calls the API. Running the page shows you the create form. Note that I didn't make all fields visible, just the fields to get the proof of concept working. 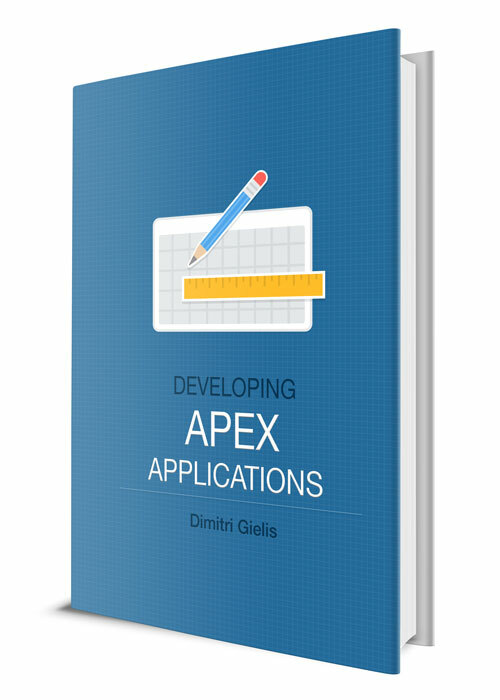 In this post we called the API to create a person from within an APEX page. The catch here was to trunk the p_hire_date parameter. I didn't expect to many technical issues using E-Business Suite (EBS) APIs in APEX as it's basically a call to PL/SQL packages. 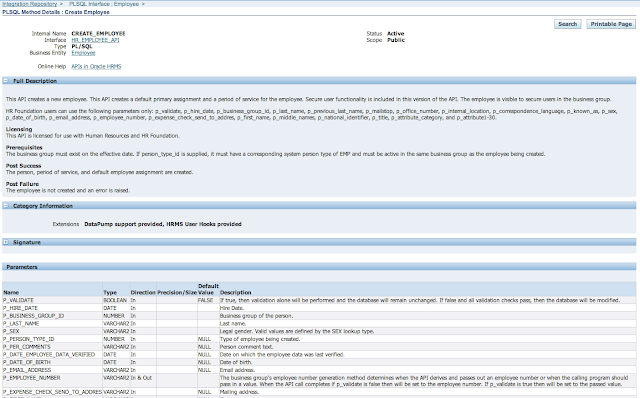 Next to that the EBS APIs seems to be well documented. I first didn't realise, but for a long time I was using the Oracle Integration Repository for EBS R11 (whereas I'm using R12). 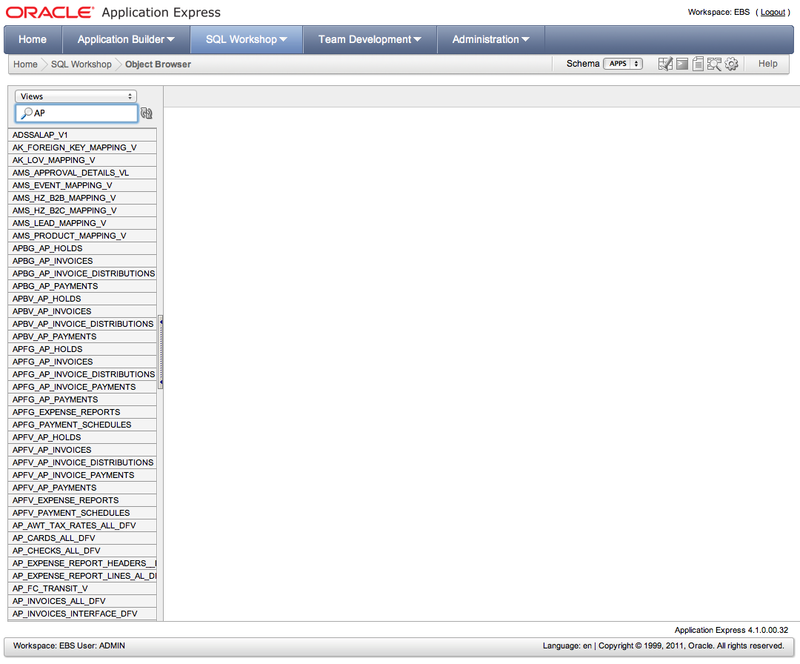 For EBS R12 the Oracle Integration Repository ships as part of the E-Business Suite. To access it, in the Navigator menu, select the Integrated SOA Gateway responsibility, then click on the Integration Repository link. Using the Oracle Integration Repository I would have found it more useful if I could define the number of results (maybe you can, but I didn't find that setting). At the moment I get only 10 results at a time, which is too low for me. I also found it not that easy to find the right API to use. I guess it comes by experience. Next to that, the parameters are not always the same, so the API could be more consistent. For example I want to create and edit a person. In the navigator I went to Human Resources Suite > Human Resource. That was logic for me. Next I looked into the list and saw Employee, so that was a logic choice for me. In there I found the HR_EMPLOYEE_API. That API allows to create an employee. So far so good, but where is the edit? I couldn't really find it, until I asked a friend and he told me to look for person. So when I went to HR Person(1) in the navigator I saw the HR_PERSON_API and in there you find the update and delete of a person. When you look at the parameters; in HR_EMPLOYEE_API.CREATE_EMPLOYEE you see a parameter p_per_comments, in HR_PERSON_API.UPDATE_PERSON you see a parameter p_comments. It would have been easier if the parameters were consistent. So once I got familiar with APIs, I started with the integration in my APEX app. Here are the steps to drill-down into a person from the people report (see previous post) and edit his or her email address. Just as with the views I find it a good practice to not grant execute on the entire libraries of EBS to your own schema. I prefer to create my own packages in the APPS schema e.g. apex_api_pkg and call the correct API calls from there. The advantage is that you can add logging to your own package or do some other extra logic in there. For example APEX passes typically back values as strings, but some API calls need to be passed (next to varchar2) as a date, a number or a boolean. So you could choose to have all input strings in varchar2 in the apex_api_pkg and do the conversion inside the package to the correct one. In the below code I didn't do that, instead I went for an almost 1-on-1 mapping. 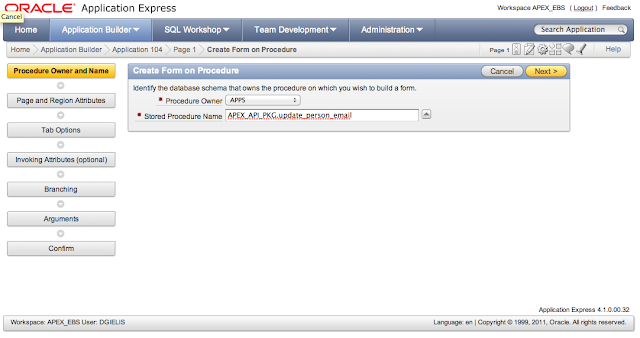 In the APEX application we create a new Form based on this procedure. I found that the APEX wizard didn't work in my case (but more on that in another post). I created a new Blank Page, add a region to it and a couple of items. From my report I created an edit link to this new page and I pass the value of PERSON_ID to this page. I just do the necessary to update the email, I don't do that much yet with the output parameters, but you could transfer that back to the page if you wanted to. Also note that the package is in the APPS schema, so don't forget to add the owner in front of it. You could create a synonym in your own schema if you preferred. For the view I find it important to have those in my own schema too, for packages only if I wanted to add some extra logic to it. Running the page shows you the below form. In EBS there are different ways (UPDATE, CORRECTION, UPDATE_OVERRIDE, UPDATE_CHANGE_INSERT), to update the record, as I wanted to test them out, I added the Update Mode select list to the form. An UPDATE you can only do once per day, CORRECTION is what I used to update the same record multiple times. Note that we still didn't login into our APEX application as an EBS user, so EBS doesn't know who I'm. As EBS is keeping an audit of the records, I (the logged in APEX user) won't be seen in those audit records, instead it will be a general one (EBS sysadmin I suppose). In the next posts we will authenticate with EBS integrate tighter.